Click the button below to add the Hansom Tackle 6 inch Aluminum Pliers to your wish list. 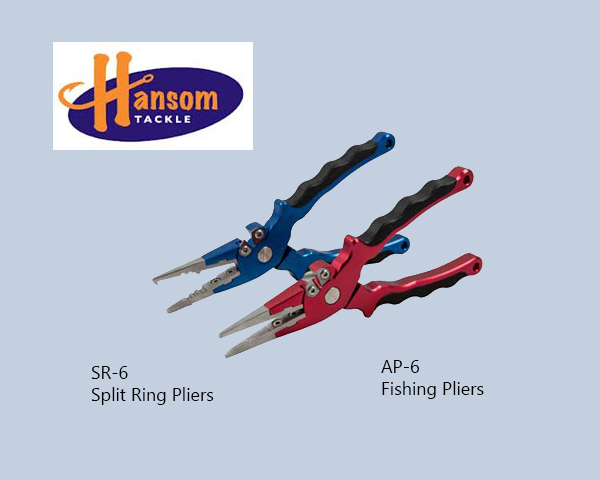 Hansom Tackle's SR-6 Split Ring Pliers and AP-6 6" Fishing Pliers feature replaceable Stainless steel jaws with an anodized, machined aluminum frame. These pliers both feature a replaceable set of tungsten carbide side cutters, and a rubber grip for maximum comfort and non-slip grip, and are perfect for freshwater and light tackle saltwater fishing. Please note: The Split Ring Pliers now comes in red color, instead of blue color shown in the photo below.